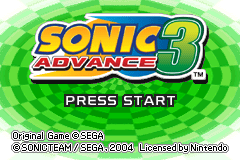 Sonic Advance 3 (ソニック アドバンス３) is the third game in the Sonic Advance series released for the Game Boy Advance. Unlike the first two games in the series, Sonic Advance 3 features ability to play two characters in a partner setting. The Tiny Chao Garden mode from the previous Advance games has been removed and the Chao Playground has been put in its place. The Chao Garden in this game serves to help the player view the Chaos Emeralds and Chao they have collected. The game focuses on Robotnik's newest creation, G-merl, as he co-pilots all of Eggman's vehicles and is an extra final boss if the player collects all the Chaos Emeralds in the game. G-merl's design and name are a direct reference to the robot Emerl whom was a playable character in Sonic Battle. This is the very last game to use the original English Sonic voice actors before they were changed to the 4Kids English (Sonic X) cast. It also contains the last voice acting done by Deem Bristow before he passed away. Sometime before the events of the game, Dr. Eggman builds a robotic assistant based upon Emerl's data named G-merl. G-merl's designed to be a loyal, obedient copy of Emerl. As such, he can learn new attacks, and can meld himself seamlessly with any mechanical device. Eggman tears the Earth apart when an experiment using Chaos Control goes awry, and Sonic is separated from Knuckles, Amy, and Cream and is stranded with Tails. The two begin to search for their friends and the source of the trouble (which is the separation of the Chaos Emeralds). But like always, Eggman is making everything from strange contraptions to doomsday devices, and is trying to vanquish Sonic once and for all. Normal Ending: (without all Chaos Emeralds) After defeating the final boss, Eggman and G-merl are defeated and try to escape, with Eggman swearing revenge. The heroes chase him to the edge of the temple, putting Eggman in a deadly situation. G-merl, stays to glare at the heroes as if to intimidate them, then jumps off the edge to follow his master. Peace is finally restored to the world. Then the game ends with all the playable characters getting their photo taken by Omochao. The end credits also leave a message to players to collect any remaining Chaos Emeralds. True Ending: (with all 7 Chaos Emeralds) After defeating the final boss, Eggman and G-merl are defeated and try to escape, with Eggman swearing revenge. However, G-merl stops running & attacks Sonic, causing the Chaos Emeralds Sonic has to scatter. Upon seeing the 7 Chaos Emeralds, the bad code that caused Emerl to malfunction activates, and G-merl uses the Chaos Emeralds to transform into a rogue, orb-shaped robot. G-merl then grabs Dr. Eggman and throws him at Sonic before escaping into outer space. Using the power of the Emeralds as well, Sonic becomes Super Sonic and, with the help of Dr. Eggman, Super Sonic destroys the improved G-merl. Eventually, Tails finds G-merl's broken body on a beach and repairs the robot. The game ends with the new G-merl playing with Cream the Rabbit at her mother Vanilla's house. The gameplay of this game is like a combination of the platforming from the original Sonic Advance and the speed-oriented gameplay of Sonic Advance 2. The game also incorporates elements from Chaotix, with its 2 character team-ups and ring-dropping enemies, though the actual ring bands are gone. The 2 character team up is similar to previous side-scrolling Sonic games as the second player actually follows the other character. This second player is controlled by the computer or player 2 in multiplayer mode. Partners can also be picked up by holding and then released. This is another element first seen in Chaotix. Like Sonic Advance 2, to play as the full cast of characters, Sonic (as the lead player) needs to defeat bosses. Knuckles is unlocked after beating Sunset Hill's boss, Amy after Toy Kingdom's and Cream after Cyber Track's. Due to the game's need for a partner, Tails is available from the beginning. Collecting every gold medal (save for the one in Nonaggression) unlocks a boss time attack. Speed: any team that contains Sonic. These are generally very fast on the ground. Power: any team that contains Knuckles but not Sonic. These are good at attacking foes, and breaking barriers to access areas other teams cannot. Flying: any team with Tails or Cream but not Sonic or Knuckles. These are good at accessing higher places in the level. Note that these are just general abilities; each team has their own strengths and weaknesses. By holding the button, the partner will jump into the leader's hands. Upon releasing the button, the partner will perform a tag action. This action is different for each character, and sometimes whether you are on the ground or not. Tag actions, along with other partner abilities, are enumerated below. A free spirited hedgehog that hates evil. He can be short tempered at times, but never turns his back on those in need of help. Due to his speed, any team that contains Sonic is designated as a Speed team, and is generally good at getting around quickly. Tag action: Sonic will propel you forward at great speed, instantly entering Boost Mode. Works the same mid-air as on the ground. A friendly kid fox with two tails, who thinks of Sonic as a favorite big brother. He loves tinkering with machinery. Any team with Tails has the ability to access high places in one way or another. If the team contains Tails, but not Sonic or Knuckles, it is designated as a Flying team. Tag action: While on the ground, Tails will propel you high into the air, slightly angled in the direction you are facing. While in the air, Tails will fly the leader around for a short time. Remember to press the button to stay in the air! A powerful Echidna with spiky fists, and Sonic's best friend and rival. He's sincere in nature, but a little gullible and easily misled. Due to his strength, any team that contains Knuckles is designated as a Power team, which the exception of Sonic & Knuckles and Knuckles & Sonic. Tag action: On the ground, the leader will throw Knuckles forward in a Power attack; this can break some walls and will destroy badniks. In the air, Knuckles will begin to glide, carrying you on his back. Be warned, if Knuckles hits a wall, he will latch on, but you will fall! Cream is a polite little rabbit that takes her tiny Chao "Cheese" wherever she goes. She means well, but can act a little childish at times. Any team with Cream has the ability to access high places in one way or another. If the team contains Cream, but not Sonic or Knuckles, it is designated as a Flying team. Tag action: Cheese will change to resemble the leader, enabling the leader to use Cream's Chao Attack. While in the air, it will do the same, but will also give your jump height a slight boost. Sonic's self professed girlfriend that he can't seem to escape from. She never leaves home without her trademark Pikopiko Hammer. Amy has no outstanding characteristics, aside from her hammer, and has no bearing on what type designation a team is given. Tag action: On the ground, Amy will use her hammer to propel you into the air. This is similar to Tails' tag action, only you are not given horizontal velocity at the start. While in the air, Amy will also use the hammer, however the vertical distance is not as strong as on the ground; however, your character is made to spin, so this move has its uses. Sonic and Dr. Eggman are forced to team up in the Extra Zone, Nonagression, when G-merl steals the power of the Chaos Emeralds. Any partner that Sonic uses to access the zone is automatically replaced by Eggman. Eggman does not affect the team type, which remains as Speed. Tag action: Sonic charges Eggman into a massive fireball that can be used to attack G-merl. The longer the button is held, the more powerful the attack. This does not damage G-merl, but must be done to make him vulnerable. Unlike many other Sonic games, Sonic Advance 3 hides its sound test until Altar Emerald is completed. 17 Intact Music 1 ??? 47 Intact Music 2 ??? 83 VS BGM 9 Try Again? The game features only one voice track in the cartridge and according to the regional version, due to size constraints. The Western versions have the English voice language whereas the Japanese version has the Japanese one, while the text language is entirely multi-lingual and manually selectionable in all regional versions. This page was last edited on 10 April 2019, at 12:52.